MALAYSIA: My beloved country. A former British colony. Made up of Malaya/West Malaysia (gained independence in 1957), Sabah and Sarawak (states gained independence in 1963, when the Confederate of Malaysia was formed, together with Malaya). Tropical climate, mostly sunshine all year round except for a few months of monsoon weather. 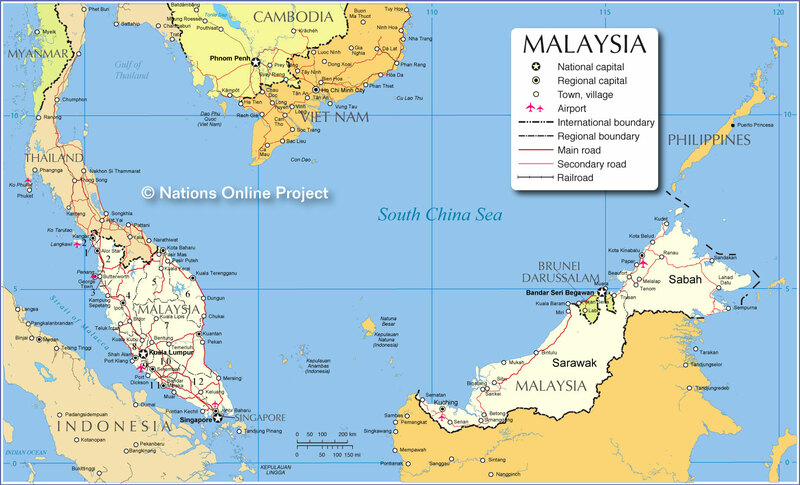 More about Malaysia here. KUALA LUMPUR: Capital of Malaysia, where the Federal government is based, as well as being business central, media & entertainment hub. SARAWAK: The biggest state in Malaysia. Where I have lived most of my life, in various different towns and cities. KUCHING: Capital of f Sarawak, my beloved home town. I was born there in 1984. Lived there from ages 4-15. Went to Kindergarten (some times referred to as Kindie), Primary school (grade school) and Lower secondary school (I supposed this would be middle high/ years 7-9). Current location. LIMBANG: A small, quiet little town on the north of the state of Sarawak. Lived there from a few weeks old til I was 4. Borders with Brunei. MIRI: A newly minted city (2005) north of Sarawak, approx 3-4 hours before you reach Limbang, borders with Brunei too. Lived here aged 17+- 21+ when I went to university here. Move back in 2009. Current location (as of today), parental unit are based here as of 2009. BANDAR SERI BEGAWAN: Capital of Brunei, where a majority of the population are based. Also known as Bandar or BSB. Lived there ages 15+ – 17+ & 21-25. Completed upper secondary (high school/ Years 10-11) . Moved back there after graduation, work there for two years before moving back to Miri. ** edited: Added map, link and changed location to Kuching.